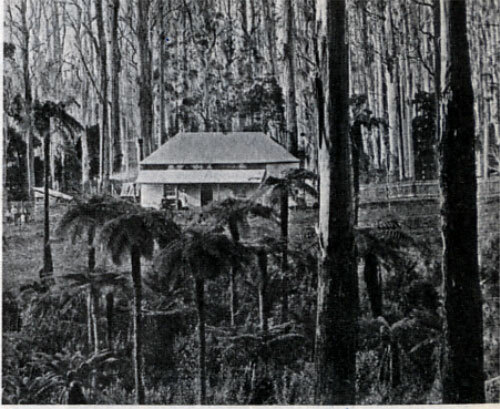 The settlers travelled with few possessions on their journey into Gippsland to take up their holdings. This was not only because it was difficult bringing in goods, but because very few of them had more than the classic “half a crown (25 cents) and a bag of flour” anyway. Settlers used what they had at hand to create such creature comforts as beds and chairs … it was a time when an axe was worth its weight in gold. 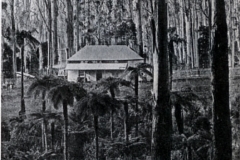 In the very early days of clearing many lived in tents, and a few in unusual dwelling places such as ‘ the branch or stump of a large blackbutt that had been hollowed out by fire” (blackbutt means mountain ash). This made a very good camp for four men. It was so spacious that they had plenty of room to make their beds crosswise. 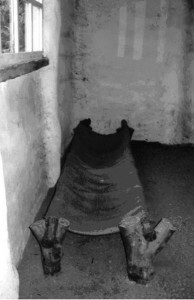 Camp beds were very rough and ready – “two flour bags stretched on poles and set on forks” or “two hazel stumps and a sheepskin”. Tables were made by driving sticks into the ground and nailing split timber onto the tops of the uprights. Chairs were four forked sticks with short pieces of wood laid in the forks. Food of the simplest sort came packed in bulk at great expense – salted meat came in casks, salt, sugar and rice in sacks, tea in chests and treacle in 100 pound (47 kgs) kegs. 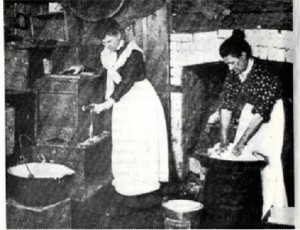 Practically every camp had no woman for the first two years and the male members of the family put work before house keeping. After a hard day one man would go home half an hour ahead of the others and light a fire. By the time the others came home the billy was boiling, potatoes (if any) peeled and on, or rice or dumplings done, ready for tea when everyone was washed. In the first five or ten years the pioneer spent all their time clearing scrub. The relatively well off had a case of axes; the poor had only one, and hoped for the best. Every scrub cutter carried a pocket stone and string for running repairs. Grindstones were rare and very carefully looked after since one often had to serve a whole district. 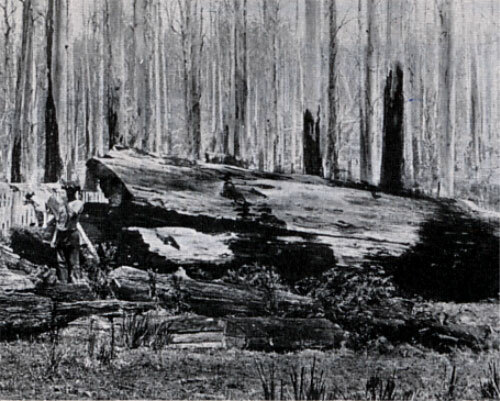 The term scrub-cutting was used in South Gippsland to describe the felling of the forest timber. It is used in other parts of Australia to mean the cutting of smaller growths of timber. 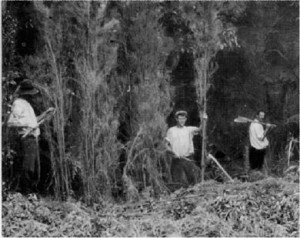 In the early stages of pioneering the scrub cutters were the pioneers themselves. 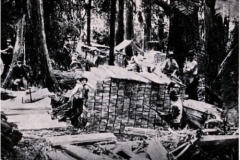 Almost every settler had to cut his own scrub – first, to clear a track in, then to build a hut or house out of bush timber. All this required the pioneer to be an expert in the use of the American axe. This meant cutting down the trees and was done by different methods depending on the type of forest and the topography or shape of the land. The first difficulty was always how to make a space for the first trees to fall into when they were cut down. 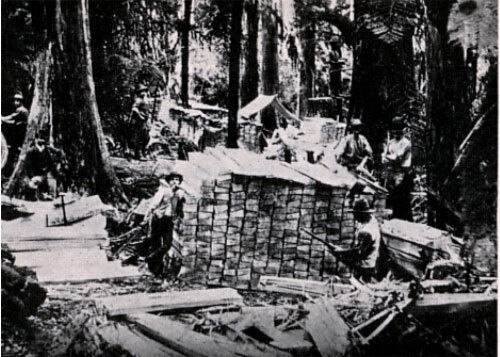 They usually started in a gully and cut the heads off tree ferns and then cut down some small trees. This tangle was then cleared away to create space to fell a big tree. Scrub cutters on flats near the Tarwin River. “A spectacular and economic felling method was quickly developed in the hilly country. Work would start from an already cleared pack track at the top of a ridge. Trees all the way down to the bottom of the gully would be ‘nicked’ on the up hill side. 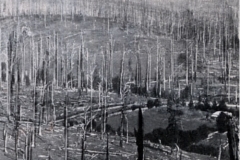 Then a few big trees high up the slope would be felled with care and accuracy to start an avalanche of spars (trunks), which bounced and crashed and roared down hill”. 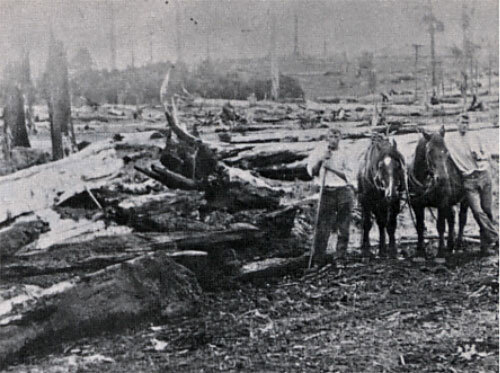 Once the tall timber was cut down, there was the problem ofclearing the remains. 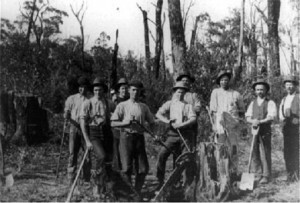 After months of scrub cutting the pioneers waited for suitable dry condition to have a burn. 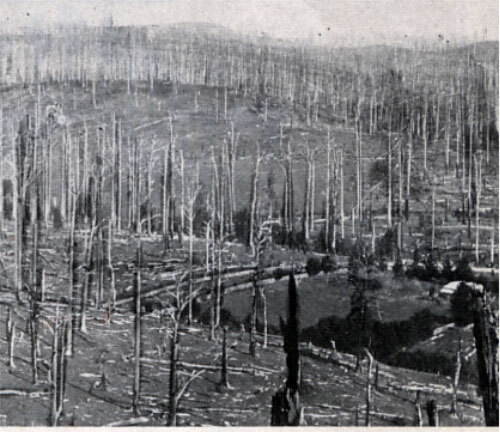 Huge fires were set and the cut vegetation burned away. Some times there were very few days dry enough to burn. In some years the summers were so wet that the burn had to put off until the next summer. It is important to note here that the rainfall was probably much greater in those days because there was so much forest. This really cannot be proven as rainfall statistics were not kept. Several days were then spent picking up, stacking and reburning. Only stumps and a few spars (trunks) were left. The term picking up does not explain the work it is expected to describe. 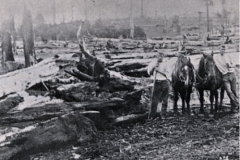 It meant cutting up and stacking all the fallen timber that remained ready to be burned again. In the early days this was done by hand with only an axe to help. The heaps were burnt at the end of the day if it were dry enough, if not on a warm dry day in early autumn with a good wind. 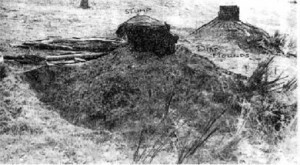 The heaps would burn for 2 hours or so then the men would go in with a shovel to restack any logs and charcoal then burn it again. 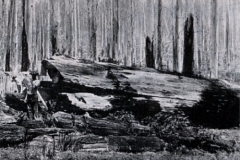 Stoving was the name given to the burning of stumps. Dirt was packed up around the smouldering stump and it would slowly burn away. An illustration of stoving from Lyn Skillern. Cleared land was sown with grasses for pasture, but the task of clearing was ongoing, After the land was partly cleared some form of farming could begin. Rye, cockfoot and clover were planted in March and April after picking up had been complete. In the first years grass growth was excellent due to the ash from the burn. After that plagues of caterpillars arrived. They ate the grass and left the thistles. In another two or three years new growth of scrub appeared as did bracken fern. Thus scrub cutting had to continue to maintain the pasture. The pioneers managed to make improvements and farm. Chock and log fences were put up, log houses replaced tents, water supplies were secured, windbreaks, orchards and gardens were planted. 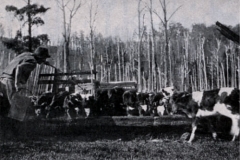 Once the property had been made into a farm settlers were able to make a meagre living from the sale of dairy produce. 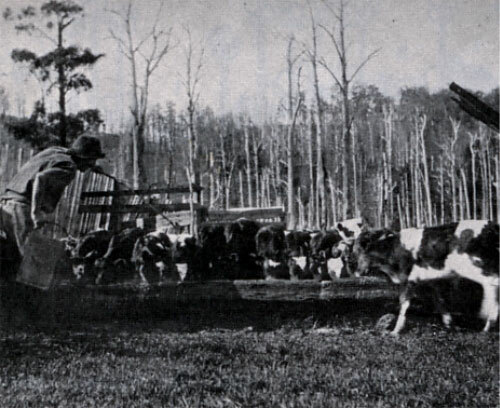 They ran cows on their small areas, hand milked them, set the milk out in pans, hand strained and skimmed it. Their butter was hand made in churns. It took two hours work for a churn of butter. The butter was either wrapped for sale fresh or salted and potted in casks. It went out along shockingly muddy and rough tracks by pack horse or sledge to distant rail heads and ports. Frequently it was held up so long at the coast that it was liquid and unsaleable by the time it reached Melbourne. Series of photos showing the forest being cleared for farming.